A large number of the greatest musicians to ever shape the history of sound first learned to play on cheap, dirty, and often times even homemade instruments. There is a very unique atmosphere that comes about when creating music with something made by your own hands—out of what was no more than garbage at the start. There is a sense of accomplishment that inspires the maker, and gives motivation to learn the limits of their creation. Those who have the desire to build an instrument are often those who also have the capacity for great musical talent that may lie hidden even unto themselves. Cigar box guitars have been around for nearly as long as their traditional counterparts. They have been crafted both by those who could afford nothing else, and by many who simply possessed a do it yourself spirit. They have now become a growing trend in many forms of music for their unique tone and style. This guitar uses an open tuning, so it is easily played with a slide. Starting from the thickest top string the tuning is: D A D F#. Any number of strings may be used, the standard for a cigar box guitar being three. Enjoy your new instrument. Similar building techniques have been applied to make guitars out of everything from mailboxes to toilet seats. It's your project, create as you please. Fantastic. The simplicity is amazing. I love how you showed how to "make" the neck. Most cigar box guitars or banjos I've seen around lately re-purpose old necks from broken instruments. Yep, for a slide guitar the neck does not need to be nearly as precise as for a fretted neck. A fretted neck is also possible to make by hand, but takes much longer. If you have a second I would really appreciate a stumble of this article. Very cool project. When you were talking about adding the tuning heads, the camera angle made it look like the neck was attached to the cigar box rather low. Is there a reason you don't attach the neck closer to the top of the box? I ask because it looks like that might cause some string buzzing issues when trying to play high notes low on the neck. Ah. I didn't realize a slide doesn't need to touch the neck. Cool! This is amazing. I am going to do this... of course I dont have a cigar box though. I will find something else though... I think I have a guitar pickup laying around somewhere, I might use that if I can find it. How did you come up with this idea? I also have an idea for making frets, I might post it if it works. Cool, I would like to see what you come up with. I didn't create the idea for a cigar box guitar myself, this is just how I went about building one. They have been around for many years. Why did you put the microphone inside the box? Wouldnt it be better to at least drill holes in the wood so it can pick up the vibrations better? 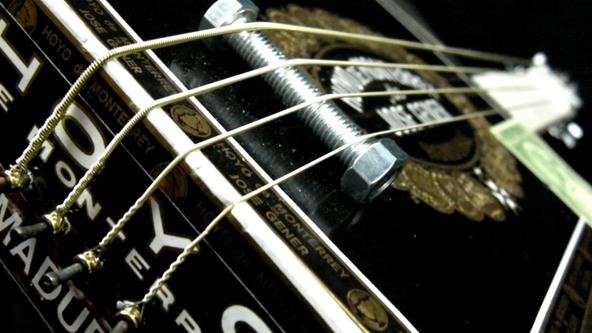 On an acoustic guitar (which is what this is most similar to), the sound is produced by the strings transferring vibration to the wood, not the strings themselves. There is no need to drill holes to allow sound to the microphone because it is the wood vibrating all around it that creates the sound to begin with. You would want to drill a hole for the sound to escape if you wanted to be able to play without an amplifier, but it would not make a difference when plugged in. Love it! How cool is that? I am amazed at how simple it really is. I had no idea. I would love to see anybody make a fretted model. Thank you for this one. Very cool, I've got to try this sometime!